We’d love your help. Let us know what’s wrong with this preview of Loving Rebel by Taylor Delong. "I’m sorry I ever thought that a life without you would ever do." From the time I was in high school, I knew that one day, I’d be Mrs. Jamison Broderick. Yet, when the invites for my wedding got sent out, it wasn’t his name connected to mine. Jamison was supposed to be my one. Or so I thought. I figured one day, I’d finally be happy with my choice. Right? The one that got aw "I’m sorry I ever thought that a life without you would ever do." The one that got away, that’s who Kyle Smarton was. I won’t accept that we are over, not even as she chooses to marry another man. She’s been mine since we were kids and if I only have one shot to prove that to her, I’ll take it. I just have to hope the girl I know, my Rebel, makes the right choice this time. To ask other readers questions about Loving Rebel, please sign up. What if Romeo and Juliet lived after being forbidden to be together, but Juliet ran far away to start another life without Romeo? What if Juliet found herself forced into said life with someone else due to lies and manipulation? Would Romeo stay true and continue to love and wait for her? If Romeo and Juliet were named Jamie and Kyle, the answer is yes. Yes, he would. Kyle and Jamie have been best friends and each others’ first, best, and most in everything. That is, everything until life gets i What if Romeo and Juliet lived after being forbidden to be together, but Juliet ran far away to start another life without Romeo? What if Juliet found herself forced into said life with someone else due to lies and manipulation? Would Romeo stay true and continue to love and wait for her? If Romeo and Juliet were named Jamie and Kyle, the answer is yes. Yes, he would. Kyle and Jamie have been best friends and each others’ first, best, and most in everything. That is, everything until life gets in the way. Kyle tries to let Jamie go so she can save him from the fallout of a huge lie, but Jamie refuses to be anything other than Kyle’s heart and home. After some seriously thorough and helpful plotting by Kyle’s sister, Jessa, she and Jamie have their shot at happy ever after...without the whole swallowing poison and stabbing oneself with a dagger mess. They have to find their way to the adult and forever version of “us” and encounter a few bumps along the way, but what a ride it is. It may have taken me longer to read this book than Taylor’s previous books, but that doesn’t mean I love it any less. Loving Rebel is full of twists and turns. It didn’t make me cry, (thanks for the shout out), but it kept me on my toes. I purposely didn’t read this book as fast as the others because I wanted to soak it in. Kyle and Jamie have such a compelling story. Kyle is the born rebel, ready to challenge anyone or anything. Jaime is laid back, but knows what he wants in life. Together they make it through all the things and find their “home”. As a reader, you get so caught up in a story and then you realize you can feel what the characters are feeling. Taylor’s books are captivating. Each story, each character, each turn of the page makes you want to come back for more. Loving Rebel does not disappoint. One of the many plot twists made me super nervous, but nonetheless, the ending was exactly what I was hoping for! This was the first book I have read by Taylor Delong, and it will not be my last! I have so much love for the main characters. From the very first two pages of the book, you are sucked in with the amazing chain of events that is how Jamison and Kyle came to be. It was sweet, and set the stage for the amazing rest of the book. By less than half way through the book, I became so invested in these characters and wanted them to get their happy ending! I wanted to cry, hug them, and throw things at t This was the first book I have read by Taylor Delong, and it will not be my last! I have so much love for the main characters. From the very first two pages of the book, you are sucked in with the amazing chain of events that is how Jamison and Kyle came to be. It was sweet, and set the stage for the amazing rest of the book. By less than half way through the book, I became so invested in these characters and wanted them to get their happy ending! I wanted to cry, hug them, and throw things at them. I am not going to lie, there were parts of the book that made me question if they were actually going to get their happy ending. I have never felt such a connection with a set of characters as I did with them. With this book, Taylor has managed to break my heart, put it back together, and break it a few more times, to finally get to the conclusion of the romance. Then the bonus epilogue gives you the closure and finality you need for Kyle and Jami. Kyle and Jamie will take you on a roller coaster ride. Their story was sweet yet emotional and I was all on board for the ride; from the very first page. I loved how Jaimie loved Kylie unconditionally -through all their ups and downs. This was a full length friends to lovers story, with many twists. The characters were fully developed. I really enjoyed it because, it was unpredictable and very believable. This was my first read from Taylor Delong. I’ll definitely be checking out her other books. Fantastic!! I usually don't like to do ARC's because someone has spend their heart and soul writing a book and I am worried about hurting their feelings.....this book was awesome!! Loved it. I look forward to rereading it slowly because I was so excited to see what was going to happen next. You just never know what is going to happen next to Jamie and Rebel!!!! Great read and totally recommended!! Thank you Taylor for the opportunity and great book!! Enjoy all!! I loved this one! I loved how the timeline spans over the course of so many years, truly showcasing the relationship Jamie and Kyle shared. And so many twists I didn’t see coming! Again, he scrunched up his face. This time, it made me giggle. My laughter quickly faded when he turned away from me, his cheeks red. "I'm sorry," I said. I hoped he wasn't mad at me. He turned back to face me a moment later. "I like you. Want to be my friend?" This book was a roller coaster of emotions. With so many obstacles in their way, that Jamie and Kyle managed to find a way to come together for their happily ever after was so rewarding! I don't think I could have expected this outcome from the way the Prologue started - don't tell me you just knew it, because I won't believe you!!!! I have never read anything quite like Loving Rebel, and having never read anything by Taylor Delong I have happily found a new author to read and love on! And when he gets her!!!! The pages seem to sizzle once they are finally together - and it's beautiful! There were moments when I felt like the universe was out to get them. Even Kyle had a bad feeling, like something terrible was going to happen to them, for most of their time in their little bubble. It was almost proven right - things could have gone so much worse for them in that defining moment when the universe stepped in and stomped all over their happiness! But they survived, and when faced with emotional and physical fallout, they almost imploded but they found their way back to each other and to a stronger relationship because of it. I think it was seventh grade when I realized I loved Kyle; it may have been even earlier, since in some ways I felt like she'd always been my girl, the girl I loved. "Don't get me wrong, I still love Kyle, but that's for you. Rebel is for me." "Hand over your burdens, Rebel. It's my turn to finally help you carry them." "I love you. First, most, best, last." 1) There's only one here - I would love Jessa and Kevin's story. Any thoughts on giving us that too? I really enjoyed this story. 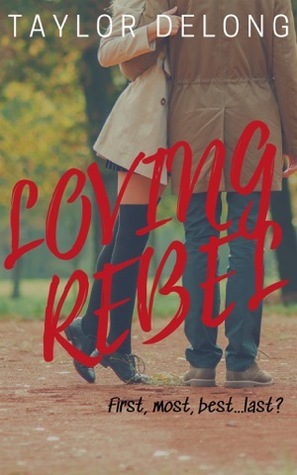 Loving Rebel was so much more than I was expecting and I know that you will love it too! So, I fell in love with this author's work last year, and, even now, her stories blow me away!!! I positively LOVED this novel. Rebel, aka Kyle, was a girl after my own heart. Sassy, funny and smart, she was someone I'd hang with in real life. What can I say about Jamie? Bossy, smart, and devoted to his Rebel, he was everything a BBF should be. I ADORED him!!! This book gave me all the feels, and in the end made my heart happy. Another winner by this author! !